Dr. Hanan Ashrawi, executive committee member of the Palestinian Liberation Organization (PLO), Thursday, denounced the Israeli Civil Administrations’ authorization of building 1451 new settlement units in the occupied West Bank, with 837 more in the plans, Maan News reported. In a statement, the PLO member accused the Israeli government of Benjamin Netanyahu of following “policies of settler colonialism, apartheid, and ethnic cleansing, to appease the violent and extremist settler population”. The reason Israel has been emboldened to scale up its settlement endeavors, Dr. Ashrawi asserts, is the unwavering support of the United States administration, and the lack of condemnation from the international community. 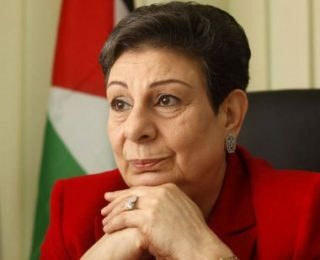 Ashrawi cautioned that the seriousness of Israel’s plan to “displace Palestine and replace it with ‘Greater Israel’, should send a strong message to governments worldwide to intervene immediately”. All Israeli settlements, built on occupied Palestinian land, are illegal under international law, as per article 49, of the 4th Geneva Convention. According to United Nations Security Council resolution #2334, have no legal validity.